View cart “Turkey Wing Feathers” has been added to your cart. 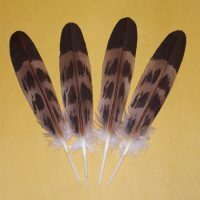 White jumbo imitation Eagle wing feathers are available with either black tips or brown tips. They run 13″-15″ in length and are wider than the average wing feather. They are sold individually.